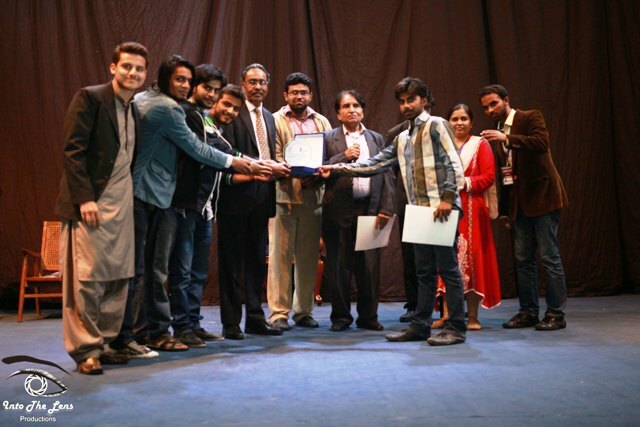 FCC Dramatics Club held the 4th edition of its Inter University Drama Festival from 20 to 21 November 2014. This year 9 universities participated in the competition. Students of FCC officially started the event with their performance titled ‘Ajnabi’. This play was a combination of two short stories of Saadat Hassan Manto ‘Neeli Ragien’ and ‘Mera Ramu’. The play was directed by Khurram Sheikh and performed by Ridda Zafar, Haider Mehdi, Khurram Shiekh and Saqib, while Narmeen Ejaz was on light and music. Later FCC students Asif Silas, Sufian Liaqat and Ashir Gill gave a comedy performance and entertained the audience. Opening ceremony was attended by Rector FCC, Dr James Tebbe. He gave positive comment about FCC Dramatic Club and particularly liked the performance of FCC students. He was presented a shield as a token of thanks by President FDC Sunny Javed and Adviser Ms Sehrish Mushtaq. The Chief Guests for the opening ceremony were Executive Director of Ajoka Theater and former Director Programs of PTV, Shahid Nadeem, and Theater Actor and Director, Omair Rana. Both the guest applauded the efforts of FDC for providing a platform to budding talent in the field of performing arts. After the formal opening Beachonhouse National University (BNU) was the first team to compete with a play full of comedy and romance. Then Bahauddin Zikaraya University (BZU) performed their play which talked about religious and moral values. The University of Management and Technology (UMT) was the last to perform. On the second day, five more universities performed in a bid to win the best play award. Government College University (GCU) gave their performance on a serious social issue regarding women empowerment and acid throwing incidents. This was followed by the performance of University of Veterinary and Animal Sciences (UVAS) which was on a political theme depicting political crisis like corruption. The play of Lahore University of Management Sciences (LUMS) was a blend of comedy and political satire with mix of English and Urdu language. Students from Ajoke group of University of Lahore (UOL) performed a delightful play filled with comedy, laughter and dance. 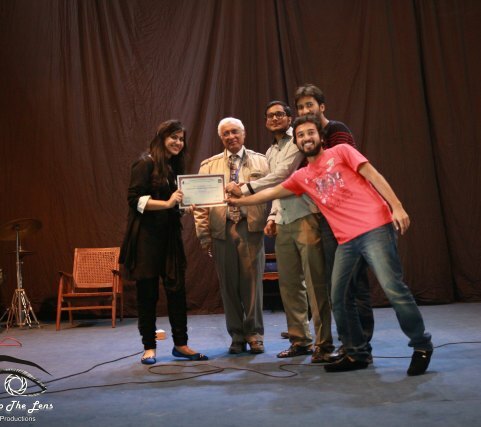 The University College of Lahore (UCL) was last to perform and their play was all about social scenario. During the event students from FCC also performed. Tanseer Zaidi sang two songs, Harrison, Ali Raza, Saud Ahmad and Nourez gave their dance performances to entertain the audience. 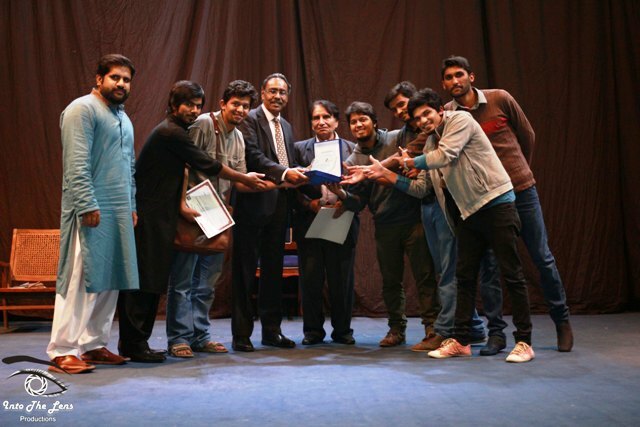 The event was judged by Faculty Member from Urdu Department of FCC, Dr Ateeq Anwer, Faculty Member from Urdu Department of FCC, Dr Noreen Khokhar, Producer Dunya TV Muhammad Hashim, and Producer Programs at PTV and renowned for his children drama Ainak Wala Jinn, Hafeez Tahir. 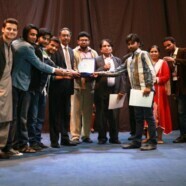 BZU got the award for best actor in a play, UVAS for best direction, LUMS for best actress. Vice Rector FCC, Dr Sufian Aslam presented these awards to the winning participants. He also gave shields to the judges. The Chief Guest for the second day was Ayub Khawar who is currently producing Mazaaq Raat at Dunya TV and is also a famous poet and writer. He gave away the first, second and third prizes to the winning teams. LUMS got the third and BZU Lahore got the second prize. While Ajoke group from UOL beat every other university and won the first prize for their creative and extremely entertaining performance.